Summary: America has the greatest military force on Earth, a terrible swift sword. We face hard times, perhaps for a few years. Perhaps for longer. Will we yield to the temptation to use our power to steal from other nations? What would our forefathers think of such a decision? How will America react to hard times? The Great Depression is long ago, and we have changed since then. The 1970’s were not so bad as the 1930’s, and are much closer to us. What solutions ran through our minds back then? Power shifts to the new Asian manufacturing nations and the oil-rich nations of the Middle East. We can compete — trim down and work harder. Buckle our belts tighter and pay our debts. The failure to oppose OPEC was the effective end of the post-war settlement. 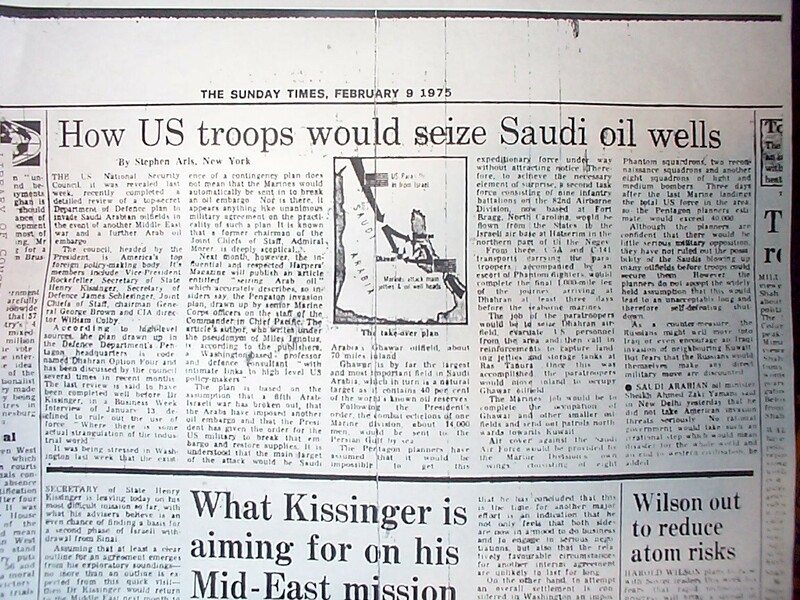 Seizing the oil, no problem, would have led to terrible corruption in America. Supported it then and realized there is no way workable that would not undermine American democracy. Surprised it took this long to bring the financial system into ruin, but failed to factor the addition of 400 million Chinese into the international equation. Fantasy about Saudi capacity to sabotage its wealth. The steal is the basis of the U.S. politico-economic deal at least since Vietnam. Without it, the tax burden might have been much higher, endangering social stability. As we see, it doesn’t work for ever. The U.S. will probably get ever less and less credit, because it is ever less credit worthy, and other debtors get more credit worthy. By the foreign debt the stealing took place already. The eventual devaluation of the dollar would complete the steal. 2. About half the subrpime papers was sold abroad, a steal. I reckon, the EU citizen is paying about 6000$ per head, to bail out his banks, money otherwise would burden the U.S. It’s a wonder they don’t sell insurance against global warming or African illegal immigration to Europe. 3.The petrodollars are recycled in the West, so oil was and still is a steal. Fabius Maximus replies: Your appear to have a unique definition of “steal”. None of these are theft, let alone armed theft, in any meaningful sense. #2 might be called “fraud”. Um … how come we haven’t done this already? $4 gas just melted down our economy and halved our wealth. The Saudi’s stole the money from us first. Fabius Maximus replies: The Sauidi’s have a limited natural resource, made ever-more valuable by our unwillingness to invest in alternative energy resources. And you expect them to give this to us cheaply? Is this the basis on which you dela with others — I want it, so give it to me cheap? Your comment is a wonderful example of America’s moral decay, make tangible. what an incredibly inaccurate portrayal of Texas independence. Check ONE SINGLE fact that will blow up the quote above: What flag was flying over the Alamo? That says it all. Crimeny, folks. Learn some history. Fabius Maximus replies: Please read more carefully. That quote was by President Grant. Unlike you and I, he actually fought in the Mexican-American War, so might have a useful perspective on that era. This is an incredibly stupid question. If we (the U.S.) need oil that badly, there are several we can do before we are desperate enough to invade Saudi Arabia. 1. Drill for the oil we already have in the Gulf of Mexico. 2. Drill for the oil we already have in Alaska. 3. Drill for the oil we already have on the Pacific Outer Continental Shelf. 4. Drill for the oil we already have on the Atlantic Outer Continental Shelf. 5. Exploit the oil shale deposits under the Dakotas and Colorado and Montana. 6. If we really HAVE to invade an oil-producing country, why go halfway around the world? Invade Mexico. It’s right next door, our border with it is basically nonexistent anyway, and the U.S. Joint Forces Command says it can collapse at any moment. 7. And if Mexico’s oil isn’t enough, there’s always Venezuela. Fabius Maximus replies: (a) As for #1-6, Oil reserves (in 10^9 barrels): Saudi Arabia 266, Kuwait 104, UAE 98. The US: 21. (b) Those other countries have lots of people, which makes occupying them difficult. See 4GW and the liberation of Europe’s colonies after WWII. The low population of the oil-bearing areas gives at least the hope of foreigners successfully holding them. Grant’s book should be a prerequisite to citizenship or voting. It does not get better than that. It is highly probable that Cheney’s energy study led to the Iraq invasion and the updating of those Seventies plans. Presuming that Democratic incompetence and Republican intransigence lead to a more severe depression… persistent high double figure unemployment… there will be a grass roots movement on the right to do this, and perhaps even rogue elements in the US military willing to precipitate it, probably best timed for the 2012 election. Even without Saudi Arabia, there is plenty to steal in Iraq and Iran and we are in good physical position to do so. It is not inconceivable that us doing this could be part of a private debt settlement with the Chinese. It is also possible that a preemptive strike on Iran by Israel could drag us into such a scenario, on the in for a penny in for a pound principle. As I mentioned in another thread, the Saudi doomsday mechanism could be a feint, which would have deterrent value in and of itself. It also must have some fail-safe mechanisms to prevent accidental detonation, detonation by a malcontent or terrorist infiltrator… which may mean that it’s the howness of the attack that will matter. One speculates that space-based or aircraft-based particle beam technology reverse-alchemizing the ‘dirty’ element to lead is not impossible, however unlikely. The number and depth of CIA moles in the Kingdom is also relevant. Meanwhile two of today’s top headlines have to do with one athlete corralling an inflated animal skin, and another inhaling the smoke of a plant. Oh brave new world that hath such people in’t! Putting aside morals, every theft would be paid for in blood. Even if you give in to the dark side and start stealing, it’s not going to be an either/or proposition with economic reform. The entire scenario is bad and needs adjustment to recognize this reality. I find it much more likely that we would monetize our military, making explicit that we provide security for the world and that the world needs to pay for it. To the extent our leadership role evaporates as others rise to the fore based on economic strength this monetization of our military becomes a more likely scenario. But I would say that even the monetization of our military would be an unlikely outcome for the simple fact that it would depress recruiting and lead us to unwind the great military that we’ve built over decades. To steal away nations would depress recruiting even more and should give pause to even the most amoral partisan of the realist school. The US military is not filled with myrmidons but rather more idealistic stock. I’m wildly not in favor of ‘stealing’ stuff by invading other countries, but could someone please explain to me how this is worse than Marxist countries that ‘steal’ stuff from their own citizens and kill them by the millions (USSR, China, Cambodia, N Korea, Zimbabwe)? Oddly enough, the history of the world appears to be that those with power use it. Who would have thought? Fabius Maximus replies: I suggest you not committ theft and try the “it’s not as bad as murder” defense. Neither the Judge nor Jury will find this logic impressive. I agree with Grant and others here, by the way, who assert that what goes around comes around. The proper moral choice on all levels is to NOT indulge in this imperialist resource grab… bad for our future, bad for our national character, bad for the soldiers we send to do it, bad for their (fellow) victims. Best of all, I think, is to adopt the kind of defensive posture Lind advocates, with some soft power outreach of the type Barnett advocates, and tend to our knitting in terms of reconfiguring our economic, transportation, and agricultural systems. Certainly those of us who are against such a thing (what I internally call The Cheney Plan) will have to push back when the time comes, if it comes, which is likely. Hopefully, we will prevail, although it may be difficult given the relative romantic appeal of farm work versus high-tech free-lunch crusaderism. This is not a good time to read F. A. Hayek’s “The Road to Serfdom”, since it’s not too hard to imagine a populist government coming to power on the back of hatred for some oil-hoarding minority (Arabs or Latin Americans) with grand plans to restore prosperity the old fashioned way. At the same time, one of the reasons we spend so much on our military is not to build up power but to provide lots of jobs in lots of Congressional districts. The high tech military is supposed to be less bloody, making war into a sort of video game played from the bridges of ships or armored command centers, but the experience of actually fighting wars is weakening that perception in favor manpower-intensive operations. As such, the unrivalled power of the US military is not available for conquest, at most demands for tribute. Given that we can effectively print the world’s reserve currency, why bother? Fabius Maximus replies: We can only guess about such things, but I disagree with the 2nd paragraph. (1) Whatever the reason for creating this military machine (“why” is usually the most difficult of questions), we have it. During tough times I suspect will we face the temptation to use it. (2) The lesson of the Iraq and Afghanistan wars is IMO that the US public is willing to accept military casualities, even when the benefit is vague or imaginary. perhaps this is the trade-off to the public’s esteem for the miltiary. (3) The idea that we can just print money to meet our needs is delusional. The consequences of this range from severe to terminal, which is why — despite its bold words — the Fed has been so reluctant to adopt “extraordinary monetary measures”, and their slow incremental response to the crisis. I began thinking about this scenario shortly after 911 when many were predicting that a second major attack on the U.S. homeland was likely. As bad as 911 was I tried to imagine what kind of response a dirty bomb or tactical nuke going off in a major U.S. city would produce. I concluded that a seizure of the Saudi oil fields would be among the responses. We’ve already heard our politicians say that our dependence on foreign oil is helping to fund terrorism so what better way to put a stop to the funding of terrorism then to seize the oil. Fabius Maximus replies: It’s amazing to me that so little weight is given to the Saudi response to an invasion. Perhaps it would go like Saddham’s invasion of Kuwait. But if they successfully destroyed a large fraction of their oil infrastructure, it would mean instant global depression — until it could be rebuilt. Years, perhaps. It’s only a matter of time… America essentially DOES already use its military predominance to ensure and control the world’s shipping, certain crucial resources (oil, minerals, etc. ), and to gently extort Europe and Japan to pony up since they don’t have to pay for their own defenses. If/when the world economy really collapses, if/when the world’s currencies go to worthlessness (see here) America’s armies, if they maintain some semblance of order, will be the arbiters of what actual goods and services go where and to whom. See the soldiers forming ‘soviets’ in 1917, warlords in 1920s China or 1990s Afghanistan, or much of Africa today: thems thats gots the guns, makes the rules, esPecially in times of chaos. Fabius Maximus replies: Can you provide some examples of how we “control the world’s shipping and resources” — and “extort” (gently seems a contradiction) money from Japan and Europe. And from whom are we defending Europe and Japan? The last paragraph seems really delusional. US land forces are almost fully engaged in Iraq and Afghanistan. How can they the world’s arbiters of “what actual goods and services go where and to whom.” The other nuke powers seem unlikely to allow us to influence them, and the rest of the world is a large place. You know, your version of the Seventies speculation & plans about military intervention in the Gulf seems to be lacking a certain something… oh, yeah: the Soviets. IIRC, these plans and media extrapolations were based on the assumption of a Soviet drang nach Arabia. As much fun as it is to hang all of our national sins and temptations upon the twin devils Kissinger and Nixon, it doesn’t help to omit context & stomp about in a self-sewn hairshirt. Really, Fabius, this sort of moral preening & retail of ethical strawmen stories is contemptible. Grow up. Fabius Maximus replies: Do you have some basis for this assertion? Any mentions of this in these documents, or any other similar documents of the time? Did you read the post? I cited evidence of a DoD plan, a Congressional Research Study, and contemporary articles by two Professors — in addition to the Nixon/Kissinger material. And this is hardly a complete list. We’ve learned that military adventures don’t even have to make sense, or be carried to a successful conclusion. They just have to be sellable initially. And, as others note above, there’s a voting constituency already conditioned to buy into this kind of thing. Not to mention our old friend, Israel, and its insatiable drive for land and resources in the ME. Look what Hitler did for Depression-era Germany. The same could happen here. My hope is that economic hardship leads people to think more realistically about their lives, demand policies that are actually beneficial to them, and reject the reactionary “enemies on all sides” appeals which are certain to come. Fabius Maximus replies: Whose resources have we been stealing since 2001? Afghanistan? If so, can you explain how we’ve been doing that, and what we seek to steal. An even greater expansion of US military spending would help the economy, because it would increase demand. But if we actually managed to steal the wealth from other countries and bring it here, Roman style, this would increase the supply of goods even further and cause even greater deflation! Our problem isn’t insufficient wealth, it’s lack of demand. Rather than using our armies to steal wealth, I suggest we send them overseas and force them, at gunpoint, to buy American cars. This will fix the economy in no time. Actually, you know, this has been done before, come to think of it. After how terribly the US has fared in Iraq, I can’t imagine the disaster that a military invasion of Saudi Arabia would be. In Iraq we at least had the shaky premise of a noble goal, the ousting of a tyrant. It seems unlikely that we could come up with something similar for Saudi Arabia, especially once people started noticing where all the oil was going. Wouldn’t an extremist be inevitable? Wouldn’t it be much worse than what we currently face in Iraq? I assume the only way to do it would be with something much more subtle than overt military force, though I’m not quite sure what that would be. It is in the nature of government to steal. Governments steal from their own citizens, so why should they not steal from the citizens of other governments? The US has become another kleptocracy almost indistinguishable from all the others. Fabius Maximus replies: I disagree that it “nature of government to steal”. Some governments “steal from their own citizens”, but this seldom true of western democracies. Consent of the governed, and all that. If we act like sheep — spurning our birthright thru sloth or cowardness — that does not make the taxes levied “theft.” We remain responsible for our government, no matter what we do. This view is, of course, contrary to the 21st Century American mantra of “it’s not my fault.” I consider that mindset a form of degeneracy, one that would disgust our forefathers. I hope the distemper revealed in this and several other posts is not reflective of an emerging norm. Once we considered Standard Oil as the Robber Baron and then Exxon who stole on our behalf, sort of on our behalf. There may be an argument, fatuous though it may be in reality, to take over resources and “manage” them on behalf of X but simply to march in and steal? Isn’t that what was at the root of the American Civil War? I think cartels are bad but if you can get away with it, who would not try? The response to OPEC of course in the U.S. is to drill and to develop alternatives. Drilling was prohibited and alternatives restricted to pie in the sky — windmills and solar just gobble up subsidies, will litter the landscape with trash and make no difference for 50 years. But the naked imperialism suggested here without any regard for its impact on ourselves, is sobering and a warning. Having put off for 30 years reforming ourselves, we have no real choice now but to build reactors. We need a national agency, based on Rickover’s nuclear inspection force, to supervise the construction of a single model or two, manage their operation on contract and oversee their security. Utilities are the one business that is now too simple and too dangerous to leave to private utilities. Me: Fabius, I have a small puzzle for you. The Fed never had an extra $ 2 trillion of its own at the start of 2008. So when the Fed “expanded its balance sheet” to extend new credit to the banks in response to the credit crisis, where did the Fed get that money from? The idea of “stealing” oil from the Arab oil ticks presupposes that it is theirs to begin with. This premise is false. The oil wealth of the Middle East was the property of those who developed it — largely Westerners — until the Arab governments stole it in a series of nationalizations. When I see that bumper sticker “How did our oil get under their sand?”, I always laugh at it… but not for the reason the car owner imagines. Fabius Maximus replies: That’s an interesting theory of ownership. On what cosmic basis do you assert its truth? Something in the Koran or Bible? Voices from the sky? Jonathan: do you mean “distemper” or disillusionment? The latter would be a good thing compared to the gullible, shameful public incuriosity of the last several years. The interesting question is, what is America’s true self-interest? Is it yours and mine, or is it Exxon Mobil’s, Halliburton’s and Citibank’s? Great post FM!! You are again, right on target. Why cannot our strategic leaders just lead and call on us to make some hard decisions and sacrifice now? As time goes on it will be harder and harder. I believe the technology exists to move to alternative energy (on several fronts). We just have to invest in a Manhatten like project, and have some lead by example guys, and we can do it. It should be noted that the Mexican dictator Santa Ana altered the Mexican constitution extra-legally, and that the original Texican rebellion desired only the re-institution of the valid consitution. They sought independence only when it was clear that was not possible. Having won independence, there was no injustice to Mexico that they later sought entry into the Union, and not less feckless of Mexico to seek to place troops on disputed soil because we were stronger. The Mexican gov’s stupidity found a just reward, per the Marine Hymn. Fabius Maximus replies: While all that is interesting, the perspective of someone who watched these events — who fought in both those wars — carries more weight in my thinking. to gently extort Europe and Japan to pony up since they don’t have to pay for their own defenses. 1) State precisely what threats now face Europe and Japan. 2) State precisely how the United States defends them from these threats. It seems to me that Europe and Japan could do very nicely if, tomorrow, the United States military simply ceased to exist. Hard to imagine the Japanese being thrilled at the idea of spending more money for the USA to sit around at their bases. There are a few fishing and small island disputes where maybe Japan might like some, err, help resolving. Though I’m pretty sure Obama wouldn’t want to open this can of worms — for obvious reasons. Just one question: if the putatively unilateralist, jingoistic, quasi-dictatorial Bush administration nonetheless saw no net benefit in seizing Middle Eastern oil fields when the world price was north of 140 bucks a barrel, how likely does anyone now think it is that the putatively multilateralist, multiculti, butterflies and roses Obama administration would see fit to pursue such a project given that the world price is now roughly a quarter of that? Please! The Obama administration has – wisely by its own lights – decided instead to steal from future generations of Americans by printing money to cover its fat “stimulus” payday for all the usual left-wing parasite beneficiary groups. Posterity, not having been actually born yet, doesn’t have tanks, planes or pre-planted destruct charges with which to resist such depredations. Hell, they can’t even send nasty e-mails to whitehouse.gov. Path of least resistance, people! Fabius Maximus replies: This is just a rant, not worth replying to. Note, however, that the “butterflies and roses Obama administration” seems determined to expand the war in Afghanistan. 2 points then a thought… First, the Saudi scorched earth plan is a myth. Besides there being no physical evidence, the Saudis would be stupid to preset demolition at pumping stations considering the loyalty issues they face from their security forces. Second, the Grant quote about the Mexican war was regarding a spiritual/divine consequence, not a socio-political response. I wasn’t sure if that was part of your point or not. I don’t think we need to bring in God smoting people into this discussion. Besides, Grant was a morose guy. As for the perspective, the American myth, I’d point out American history/culture weighs heavily in favor of a resource grab. If history follows its pattern, we’d seize the oil fields, fight a brutal insurgency, exploit the resources, then once our objective was achieved and we had what we came for, we’d feel bad. Arabs would replace Native Americans as the character of guilt in American folklore, just like SE Asians especially Vietnamese did in the 80’s. Part of me would like to see a good old fashion land grab, for the same reason that I’d like to believe the conspiracy theories about the US being behind 9/11. The government would be evil, but at least it would be compotent. It would be better then the proto-keynesian idiots and their new deal lite we are currently looking at. Fabius Maximus replies: As for point #1, I find fascinating the confidence of so many people who post here, the certainty about which they write about things. Esp since the serious experts I know typically express their views much more tentatively, aware of the limits of their knowledge. Esp interesting we see in the comments so many folks who consider their opinion of these matters vastly superior to those of someone who lived in that era, who fought in those wars, a distinguished general — and President. Disagreeing with him is one thing, but this “I’m correct and his opinions are nothing” seems … curious. The good news is that American educators can feel good that their emphasis on building self-esteem has proven so successful. Feh! I should presume you put equal weight to the validity of Lee’s views that led to his treason? He fought the same war. Every fact I related is true, and they justify the Mex-Am war entirely. First, we stole Afghanistan’s control over its government, which then allowed us (potentially) to control the proposed pipeline from the Caucusus through Afghanistan and Pakistan to India. Second, on the premiss that the invasion of Afghanistan was just a prologue or pretext to the invasion of Iraq, we PLANNED to steal Iraq’s oil. It hasn’t worked out, yet, but that would have been quite a theft. Fabius Maximus replies: Perhaps. IMO the pipeline story is weak, not justifying such a large-scale project. A story perhaps advocated by people watching too many Bond films. I see no way in which overthowing the Tailiban (more of an intervention than an invasion) was a “prologue or pretext” for invading Iraq. How can a military occupation be a “prologue” (a literary term for the introduction to a play)? How was it a “pretext” for the invasion of Iraq? Since al Qaeda was based in Afghanistan, there was some justification for our actions there following 9/11. Unlike Iraq. I find the lead post somewhat baffling overall. The thrust in the middle seems to be implying that you/we are talking about using the Great US Military to go around and ‘steal’ things like oil and other resources, but then in comes the ‘theft’ of Texas as some sort of (imperial/colonial?) example. I don’t get the connection. The most valuable resource in the world in any system is people; next is land which cannot be possessed without the former being within the fold or thoroughly dominated, something which only lasts for a little while usually. Even the successful Mongol takeover of the Arab Kingdoms which lasted a couple of centuries, if I remember correctly, very soon became a dynamic wherein the Mongol Khans in charge had converted to Islam and were essentially folded in, much the same happened to the third generation Khans overseeing China. The official heirs of the first Great Khan were back in Mongolia disgusted with the whole thing. There is nothing worth stealing for the US in the Middle East because we can never truly annex the people as citizens, and therefore never control the land. With friendly relations, oil will be drilled for, shipped and processed at reasonable margins. b) use it as an excuse to maintain our hyper-military national psychosis. By controlling Afghanistan both America and Israel has seized virtually the entire opium supply of the world which is worth many hundreds of billions on the world medical (morphine, etc) and illicit drug (heroin, etc) markets. Fabius Maximus replies: Thanks for the additional detail; that is … interesting news. We don’t need to be drastic here. We could just insert a Buy American Clause in the stimulus legislation and let the starving wogs all go and eat eachother. Al q’aeda. WMD. War on Terror. These narratives, started in Afghanistan, were precisely prologues and pretexts (operative overtures, or test runs, if you wish) to the war in Iraq. Of course the connection wasn’t logical, but it existed in the public mind and became the rationale for the second invasion. Some even say that 9-11 was part of the narrative, planned or allowed to justify all that followed. Whence arose this myth of America’s “great military”? What self-deluded ignoramus started that ludicrous fairy tale? America fought the Korean War to a draw, lost the Vietnam war decisively, managed to eject the Iraqis handily from Kuwait but then failed to finish the job, America lost decisively in Lebanon (but was wise enough to retreat fast enough to save face after 300 of our servicemen were blown up by a suicide bomb) and we lost even more humiliatingly in Somalia, won decisively in the Balkans in 1998, and America has decisively lost both the 2nd Iraq and the current Afghanistan war. That’s 1 stalemate, 2 decisive victories, and 4 decisive losses. 2 out of 7 wins. This is a glorious military record? Where is the evidence of America’s allegedly peerless military success? The claim that America has “the greatest military force the world has ever seen” is a delusion confected by grossly obese football fans who waddle around waving giant foam hands and shouting “NUMBER ONE!” while remaining pervasively ignorant of military history. Temujin had the greatest military the world has ever seen. By comparison, America scarcely rates as a footnote in world military history, especially given our sorry record of nearly continuous defeat since WW II at the hands of barefoot peasants armed with bolt-action rifles. Led by inept dishonest fools and armed with useless fragile Buck Rogers superweapons that don’t work, America’s military would be a bad joke if it wasn’t bankrupting our country and turning America into a civil-rights-free garrison state. Fabius Maximus replies: Thank you, that is a different and valuable perspective. We are the most powerful in many physical metrics — numbers of captial ships, sophistication of aircraft, numbers of this and that. But the track record of this formidible force is far less impressive. As the results of our wars in Iraq and Afghanistan demonstrate: unimpressive results achieved by an almost total committment of our forces, at mind-numbing monetary costs (plus quite a toll in blood, shed on both sides). Steal, noun: Informal. something acquired at a cost far below its real value; bargain: This dress is a steal at $40. The double meaning is no coincidence (bargain achieved under duress?). Bill Clinton argued last week in Davos, the Chinese should buy more Treasury paper in their own best interest. Was “best interest” a vailed threat? That’s the theme we are discussing here! Still, one remark of his, goes against this, he said, “we cant get divorced”(from the China)! If so, it would be better to change the posture. Why go to the trouble of invading, holding the land and even running the facilities if we can simply extort the price of oil lower by threatening Mecca? Tough to perform the Hajj if the site is a piece of glass. Fabius Maximus replies: I assume you are kidding (or insane). They easily could strike back at the US. Bioweapons, for instance. And with their money they could buy nukes. Three more potential armed thieves ? Private armies of self-serving commanders , hatched from poorly accountable , multinational peacekeeping forces . I don’t have the time nor the data to analyse Saudi oil facilities. But it seems to me, in light of the iraqi experience, that even if their facilities were not set for quick demolition (as it was for several strategic bridges and tunnels in Europe pre WW2, so it would not be without precedent) they would still be very vulnerable to a sabotage campaign. We are speaking about a network, or better, a network of networks of rather vulnerable systems. Pipelines carrying highy combustable hydrocarbons, the power grid feeding the pumping stations, water lines to pressurize the oilfields and so on. These things are rather vulnerable and with access to some inside info it’s likely that devastating synergic attacks could be carried out even by relatively small numbers of saboteurs. Unless you can basically get rid of all the locals inside and around ALL the interested facilities, which is likely to be an enormous area, and prevent most infiltrations sabotage is going to be painful. Anybody with specific info about Saudi oil extraction system layout is welcomed to comment/criticize the above. Why? “Government”, as President Washington said, “is Force” – “a dangerous servant and a fearful master”. It is most certainly theft to take money from some citizens and redistribute it to other citizens for things that are of no direct beenfit to the common good (the enumerated powers of Article I Section 8). Every Western Democracy places armed guards behind bushes with radar guns and extorts those who drive “too fast” for money in the form of speeding ticket fines. This is nothing more than government sanctioned highway robbery for an activity that is harming no one. Our government has laws that say that if you carry around or deposit too much cash at once, they can simply seize it as prima facie evidence of criminal activity. And of course, welfare redistibutionism and foreign aid is most certainly organized theft, as it is the taking of my money for purposes I would never freely consent to if given a choice free of the threat of prison for non-compliance, and giving it to other people I would never in a million years have gifted with a single dime. Lovely. We are responsible for it, but have no control over it.